← I Survived Another Psychic Attack! 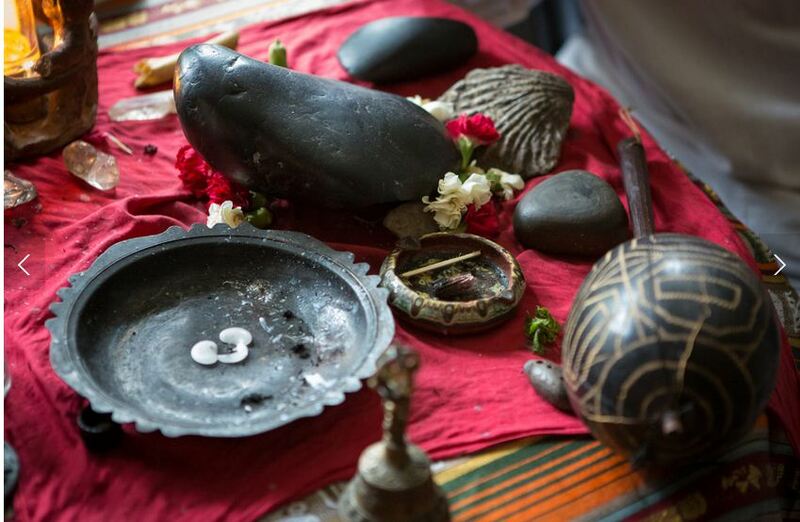 The interesting tools used by a contemporary shaman (photo credited to The Healing Initiative: http://thehealinginitiative.com/portraits-of-healing/2013/7/19/itzhak-beery-shamanic-healer-and-teacher). I didn’t initially choose to go into training as a “shamana”. I was dragged into it 😉 . I had talked about my background before as a corporate person (it seems so long ago but it’s been only a couple of years ago when I was tackling and drafting profit reports and Powerpoint proposals on an everyday basis instead of herbs and crystals ;). At that time, if you mentioned to me about shamans, spirits and spirit journeys, I would have laughed it all off and say, “This thing is not for me, sorry! Maybe you can convince the quack doctor down the road to listen to your stories!”. Until of course, I got the call. The call was opportune. It came in the form of a problem (see the story here: https://shamanainthemaking.wordpress.com/2015/08/03/learning-to-communicate-with-interdimensionalextraterrestrial-beings-thru-a-crystal/). The problem was my fav rutilated quartz pendant got enchanted by a powerful local warlock through my friend Jennie who was under a spell by him. When the solution to the problem was serendipitiously presented in the form of my mentor Riana who helped me “exorcise” my crystal and several other crystals I owned from the enchantment sent by this powerful local warlock, I had no choice nor any recourse but to be ushered and introduced to the tools and lifestyle of the “shaman”. You might be wondering why I had to study shamanism then. Well, that incident with the enchanted crystal was like opening Pandora’s Box. When Riana and I disenchanted all of my crystals, it didn’t go down well with the powerful warlock (we can call him Mohan for record purposes). He sent his minions our way (for the sake of our readers, let me enlighten you that in these islands, we have these ancient stories of “mythical flying monsters” (actually this is a form of reptilian creature created since the dawn of the Rs on the planet) that come out at night and plague the local population by flying above their houses and preying on hapless families/households who have newborn infants or dying/very sick residents in them (I will narrate later a personal story of this in another blog post). Well this was what that warlock unleashed on us – a number of these flying creatures who constantly terrorized me and my mentor Riana. The only way to counter this scourge from hell is to protect oneself from it using the tools and trade of the shaman, at least that’s how I see it from where I am sitting now. There are still many ramifications to my story but I will have to reserve the tale for another day. 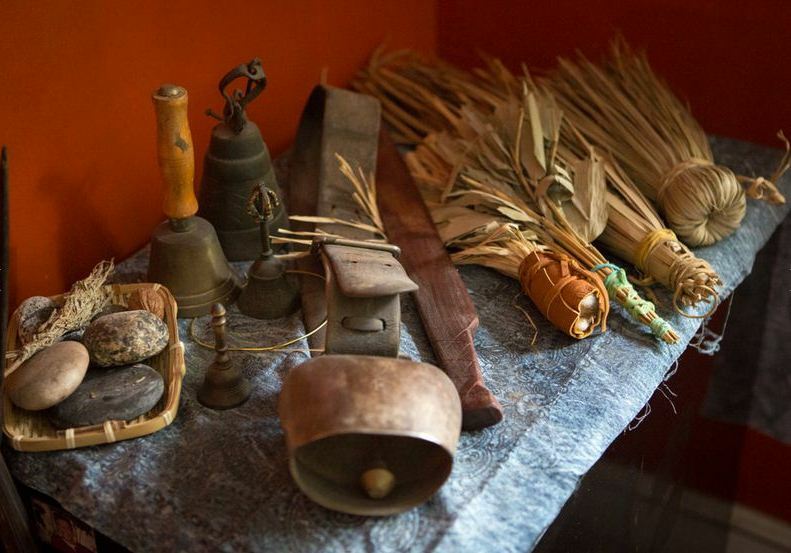 More of the shaman’s tools of the trade (Photo credited to The Healing Initiative: http://thehealinginitiative.com/portraits-of-healing/2013/7/19/itzhak-beery-shamanic-healer-and-teacher). But bad shamans can become good shamans – at least in Buddhism, it is believed that we are reincarnated again and again in this 3D world because we are being given the opportunity to correct the wrongs we’ve done in a previous lifetime/incarnation inorder to remove our negative karma (Karma, in the Buddhist sense, means “the sum total of one’s actions which determine one’s future or fate/destiny) a basic concept of Buddhism”; definition care of yourdictionary.com). How Does One Start Off Training to be a Shaman? I had two sources of information on this. One was Sandra Ingerman’s website (I didn’t have her book yet) and talks on shamanism by the most prominent and respected shamans in the world in The Shamanism Global Summit 2015 just concluded last month. The other one was a quaint blog I found on the internet by a shamana named Sarah Petruno (http://www.sarahpetrunoshamanism.com/bloghome/). It was largely through her story as a shamana taught and honed by the spirit of her long-dead great-grandfather from an Eastern European shamanic lineage that inspired me to embrace the calling of being a shamana. • Traditional (“shamanic techniques, names and functions of spirits, mythology and genealogy of the clan, secret language, etc.) The two-fold course of instruction, given by the spirits and the old master shamans is equivalent to an initiation.” (Mircea Eliade, The Encyclopedia of Religion, v. 13 , p. 202; Mcmillian, N.Y., 1987.) It is also possible for the entire process to take place in the dream state or in ecstatic experience. Thus, there is more to becoming a shaman than a single experience. It requires training, perseverance and service (underscore is mine). Now the above information was something I thought about deeply for two reasons: 1) Our experiences in the shamanic lineage, at least for Riana and I, were downloaded to us from past-life regressions and additionally for me, just plain intuition (it seemed like I could just intuitively use certain herbs and plants for this kind of vocation); and 2) the popular notion that to train as a shaman, one has to find a mentor who has a “reputable lineage” as a shaman. Even if the mentor or mentoring is in the “dream state or in ecstatic experience”. Does a past-life incarnation as a shaman help to provide legitimacy in training as one? Or the motive to help others by using one’s shamanic skills and knowledge assist one to become a “good shaman” nonetheless, despite the lack of prominent lineage or connections to such reputable shamanic lineage? Do I really have to go into a trance to research and recover information about a subject or a client? Riana did not go into a trance to retrieve information about a client (as I had written about in an earlier blog post). We made use of crystals and consulted enlightened, multi-dimensional positive guides/entities to get information about practically almost anything except the Akashic Records of someone other than ourselves). And I believe that a requirement to be a “legitimate” shaman is to “have a community somewhere to serve”. This is because a shaman’s reason for being is to be of service to others, to a community he/she belongs to, right? A bit of a tall order for me, since I’m supposed to be incognito due to the occasional attacks sent to me by Team Dark – until such time that I have mastered the shamanic arts and can adequately defend and protect myself against Team Dark, right? Plus, I didn’t know of any shaman in the islands except those who were living in the bush ; ) And I was wary of consulting dead spirits or malevolent entities/spirits even though seeing and conversing with them was getting to be more common to me nowadays (they literally just jump up or make their presence felt sometimes, even if I don’t see them but I feel them around). This entry was posted in interdimensional communication, multidimensional communication, PSI capabilities, shamanic healing, Shamanism, Spirituality and tagged Buddhism, karma, Reincarnation, shaman in training, shamanic lineage, Shamanism, spirituality, Team Dark. Bookmark the permalink.